Games for specific team offers real time validation on drag and drop but all can be validated using the Validate button on the grid. Maximum games can be set for all dates and all teams. This is done on the scheduling grid on the Settings page before creating the grid, or ⚙ Settings button at the bottom of the grid. 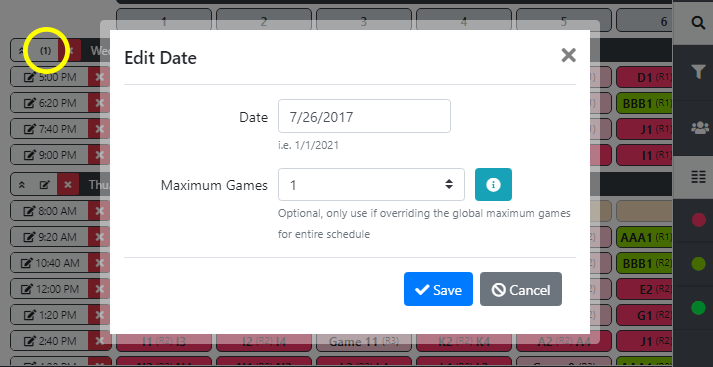 Maximum games for all participants for a specific date can be set on the schedule grid date. Click the Edit button and set the option. Teams can also have a maximum games per day or per event along with a minimum amount of games. This can be set on the Restrictions page of the event or imported with a set of teams. The restriction can be of type Game or Venue. This option will also take into account the number of games created for pool play when you autocreate your pool games.